Bali, a small beautiful island with a lot of tourism potential both from natural and cultural aspects. For a long time, Bali has been known for its beautiful beaches and people’s hospitality. Bali Island consists of 9 regencies which each of them has its own unique and interesting tourism objects. 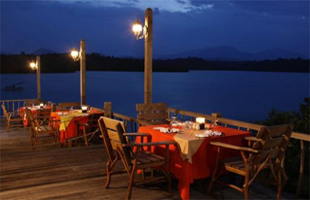 Buleleng is one of the regencies which can offer many interesting things for its visitors. This regency is on the northern area of Bali Island with its capital named Singaraja. Buleleng is very famous for its Lovina Beach which is the only place in Bali where you can observe the life of wild dolphins. Besides that, there are also Banjar Hotspring and Buddha Vihara which is of the largest viharas in Southeast Asia. Located mostly on the shore of North Bali, Buleleng has a lot of potential tourism objects which need to be exposed, for example “Banyuwedang Hot Spring”. If you have already heard about Banjar Hot Spring, Banyuwedang Hot Spring is located on far West of Buleleng, in Gerokgak District. Situated approximately 60 km from the capital city, Singaraja, this place can be reached for about 1.5 hour. Banyuwedang Hot Spring is on the route of Singaraja – Gilimanuk in Pejarakan Village adjacent to the West Bali National Park. Banyuwedang Hot Spring’s water contains a lot of sulfur with temperature around 40 degree Celsius. Due to its high amount of sulfur, the water here is smellier than the water that you can find in Banjar Hot Spring. Uniquely, this hot spring is located on the seaside, as if the sea has changed into a kind of big hot water pool. 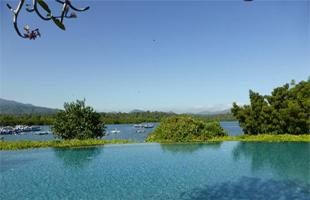 This hot spring is also surrounded by vast mangrove and beautiful North Sea of Bali. Water with sulfur content has been known as traditional treatment for skin diseases, so some of the visitors also come here to cure their illness. However, you can still enjoy this hot spring as a place for escaping your tiring routine and refreshing your mind and body. The hot water of this hot spring actually comes from the beach and will become lower than the sea water when the tide is high. The hot water comes out in a big volume so around the area round-shaped concrete structure was made as a dike. This dike was made to prevent the hot water mixed up with the sea water. 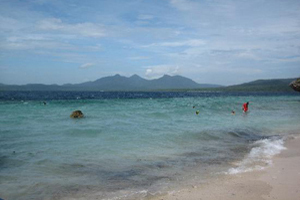 Besides its seaside hot spring, Banyuwedang area also has beach, bay, and white sand. One of the best diving and snorkeling spots in Bali, Menjangan Island, is also located near here, so if you want to you can visit it anytime. As an emerging tourism spot, Banyuwedang now has been completed with a lot of public facilities such as wide parking area, toilets, and some small restaurants or food stalls. Just like the other hot springs, Banyuwedang is not only completed with bathing area, but also completed swimming pool. If you don’t want to swim, you can still bath inside the private bathing room which is completed with hot water shower as if it is a bathroom in your room or hotel. This room is located separately between men and women. Banyuwedang Hot Spring is a perfect place for you who want to escape from you daily routine and the bustle of big city because it is located in a tranquil village where there are still a few people there even though it is located on the side of the road. Banyuwedang is a dry and barren area so most of the plants here are kinds of desert plants which don’t need much water. If you are heading to Gilimanuk through Singaraja, you can try to visit it and enjoy the natural hot spring of Banyuwedang.